Josh Funk is fab at doing funny. His first fractured fairy tale (good news, there’ll be more! 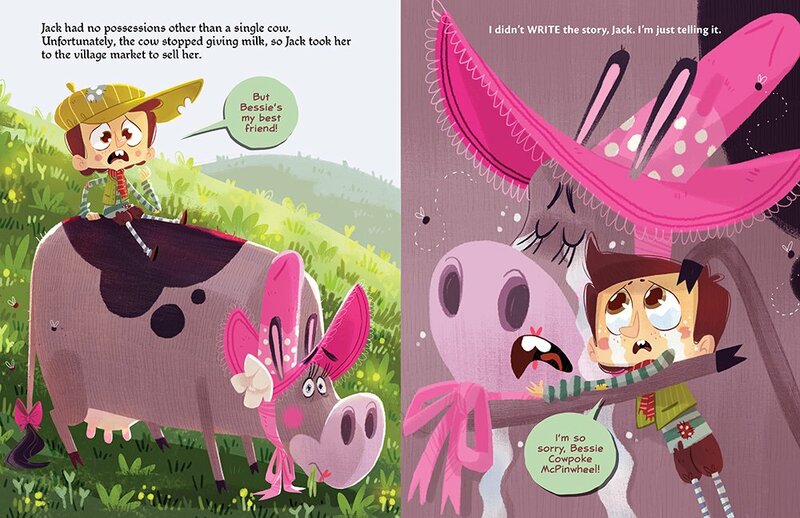 ), It’s Not Jack and the Beanstalk, breaks with picture book convention and the fourth wall or maybe it’s the fourth page in this case, by introducing an uproarious dialogue between the narrator and the main character (to name a few) that kids and parents alike will eat up. Parents, caregivers and more experienced readers will be unable to resist the urge to to jump in and take on voicing all the characters’ roles if reading aloud. Being a fractured fairy tale, this story unfolds with a humorous back and forth between the narrator and the titular Jack (see artwork below) whom he must awaken in order to get on with his storytelling. Soon Jack has his magic beans, but he’s also been growing frustrated with the direction of the tale, often making demands of the narrator that are not unlike those of a child who doesn’t want to do his homework, brush his teeth or go to bed. While climbing the seriously high stalk, Jack sees his pal Cindy (Cinderella) on her palace balcony. Here readers first see the hilarious and unexpected interplay between some beloved fairytales that will no doubt be a feature of Funk’s future fractured fairy tales and a most welcomed one. Inside the giant’s house, an enormous shadow on the wall and “a booming voice” signal just what’s in store for Jack. Then, quite unexpectedly and most certainly not in the original version, our hero gets a bit sassy about the giant’s poor rhyming skills. This does not bode well for Jack and before too long it’s looking like he’s going to be the main ingredient of Giant Stew. Once again interrupting the narrator who’s so desperate to continue the story, Jack casually but oh so cleverly mentions something to the giant that he’s hoping will change his fate and positively influence an alternative ending. Funk’s flair for terrific twists promises to satisfy all readers eager to see the pieces of this fractured fairy tale come together seamlessly. 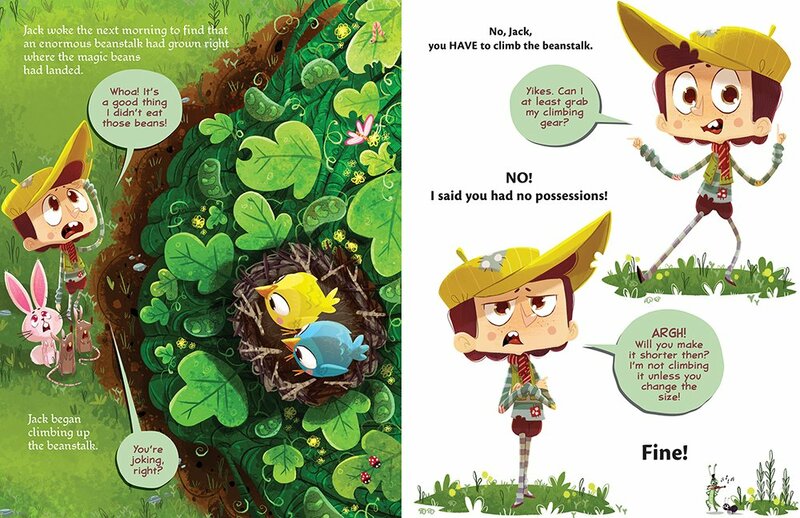 It’s Not Jack and the Beanstalk is a very visual book that instantly invites readers to study all the details on every page of Taylor’s appealing artwork. On the back of the book’s jacket cover, readers are told to “Look for the gingerbread man, the three blind mice, and other fairy tale friends hidden though out the book!” I quite enjoyed leafing back through the pages to see what characters I might have overlooked on the first read and so will your youngsters. Get a copy today to get in on the jokes. 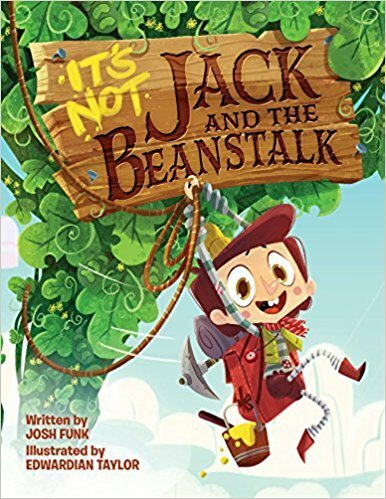 It’s Not Jack and the Beanstalk will make fairy tale devotees of a whole new generation of young readers while sprouting a whole new crop of Funk fans along the way. 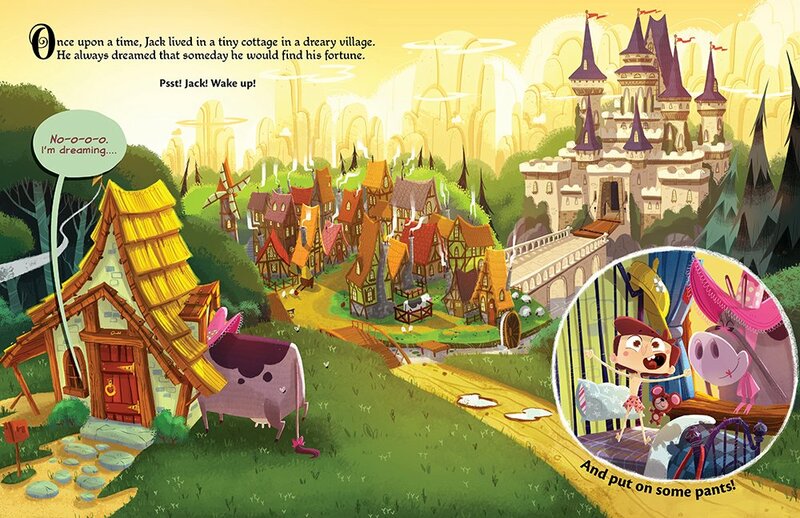 All interior spreads from It’s Not Jack and the Beanstalk are courtesy of Two Lions. When my daughter was 7 or 8 she became infatuated with fairy and witch stories. But that was 13 years ago and the selection wasn’t very exciting. I’m happy to say that now there are so many more interesting books featuring assorted magical creatures and Mary Losure’s Backwards Moon (Holiday House, $16.95, Ages 7-10) is one of them. This recently published middle grade novel is perfectly suited for tweens who want action, adventure, fantasy and a satisfying conclusion, all in just 134 pages. Cousins Nettle and Bracken are the two youngest witches in a coven made up of mostly older witches (“They were not just old, they were very old. Some were hundreds of years old.”) who live in a hidden valley being encroached upon by humans. The book opens on the very day that the girls discover something has gone terribly wrong with the magic Veil, originally spun to shelter their community from the outside world. Suddenly it’s looking like the carefree days of playing Catapult are over. Things are about to change forever, thrusting Nettle and Bracken into a mission to save their coven by traveling to the human world. There the witchlings will attempt to find untainted Wellspring Water, crucial for the damaged Veil spell. They’ll also eventually seek out the Door leading to a safer world for all witches, far from the menacing presence of humankind. Even though the older, more experienced witches would seem like the natural choice to make this dangerous journey, the fear of Fading, or loss of magical powers caused by the proximity to humans, stops them from trying. The cousins’ youth, while providing them with increased protection from the Fading, does not guarantee immunity putting them at considerable risk as well. Losure has created a believable world where only young humans can see the witches, initially complicating matters, but ultimately helping the girls on their quest. I found it fascinating how the author was able to convincingly convey the collision of the witch world with that of humans, in fact she had me at Seeking Stones. (magical rocks that will assist the witchlings). There are several engaging characters who help Nettle and Bracken including a young human girl named Elizabeth, a Witchfriend named Ben and a caring raccoon. Losure has included a nemesis for the cousins to evade, as well as many close calls that will keep tweens entranced. In 21 short chapters, we’re whisked away to a wonderfully imagined world where wishes can be used up and time is not necessarily on the side of the plucky main characters. All that makes for a more layered read and a desire to follow Nettle and Bracken into the safety they seek behind the Door, perhaps in a second book? I can wish, too! Click here to read an excerpt from Backwards Moon. Buy the book from Indie Bound by clicking here. This giveaway will be a bound book giveaway, sent to the winner from Holiday House. The winner must be a U.S. resident and over 18 years of age (parents/guardians can enter for children if they’re interested). 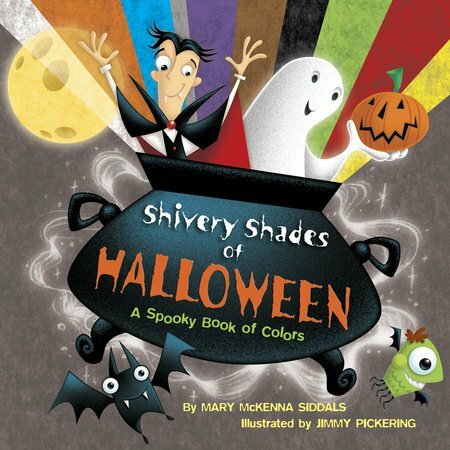 Mary McKenna Siddals‘ Shivery Shades of Halloween: A Spooky Book of Colors (Random House Books for Young Readers, $12.99, Ages 3-7) with illustrations by Jimmy Pickering is such a great idea for a picture book! I liked Shivery Shades of Halloween: A Spooky Book of Colors so much that I want to read more books like it, a series perhaps: The Tasty Tones of Thanksgiving or maybe the The Crimson Colors of Christmas! 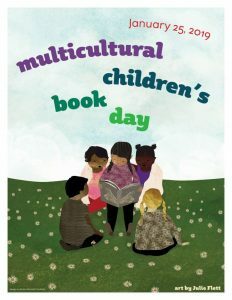 Okay, so those titles need some work, but after you read this clever new picture book and hear the hardy laughter of your kids, I’m sure you’ll agree it’s very, very catchy and it couldn’t hurt to have others in the queue for our favorite holidays. … in addition to the synonyms used for the word “color” – had to look that one up and it’s not easy, but Siddals pulls it off perfectly. There’s tinge of green, stain of red, glint of yellow … pigment anyone? Pickering has designed an adorable (well, the sharp teeth aren’t SO adorable) bat-like creature (see lower right hand corner of cover above) who is colored all the shivery shades of Halloween and changes hues to match each scene it’s in. The youngest readers are bound to get a kick out of seeing when and where it turns up. The entertaining artwork features a bandaged-up red devil, a yellow cheese ball moon and a caped black cat. Pickering’s imaginative illustrations reminded me of Phineas And Ferb, one of my cartoon faves, meaning they’re never creepy and actually quite inviting. Frankly, good Halloween picture books are hard to find. 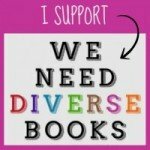 It’s why we see older titles turning up on lists and book shop displays again and again. So when a cute, creative new one like Shivery Shades of Halloween comes along, it’s worth noting. No newcomer to children’s books, Siddals gift of rhythm and rhyme is evident on every page promising to make Shivery Shades of Halloween a read-aloud request this holiday. 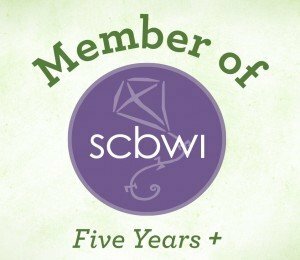 GRWR: How did you come up with the idea for the book? MMS: The idea for SHIVERY SHADES OF HALLOWEEN began with asking myself the question that opens the book: What color is Halloween? While musing about how black and orange predominate as the colors typically associated with this holiday, it occurred to me that Halloween is not only brimming with other colors, but that every color actually takes on its own distinctive spooky tone. I began brainstorming the images that came to mind for each color, playing with the adjectives that might be used to describe them… and before I knew it, a manuscript was beginning to take shape. Of course, there was lots more tinkering involved… establishing a framework with rhythm and rhyme… giving the text a direction that implied a journey through the spectrum of the night… and plenty of wordplay to make it all work… but in the end… BOOyah! What emerged was the spirited text for SHIVERY SHADES OF HALLOWEEN: A Spooky Book of Colors. Find Shivery Shades of Halloween on Facebook here. Follow Jimmy Pickering on Facebook here. Twenty Days to Stop The Future! 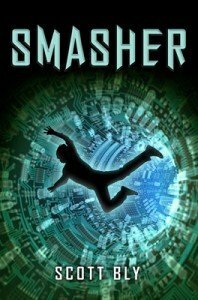 Today Ronna Mandel reviews Scott Bly’s debut middle grade novel, SMASHER (Scholastic/Blue Sky Press, $16.99, Ages 10-14). I met Scott Bly at the L.A. Times Festival of Books several weekends ago. There I had a chance to watch a video of his book launch at Skylight Books in March. He played guitar and sang. Yes, sang, and what a terrific voice! And speaking of voice, middle graders are going to really enjoy the voice in Bly’s sci-fi page turner, SMASHER. Set in the not too distant future of a city called LAanges (Los Angeles), SMASHER is full of plot twists, dark secrets, inventions, good versus evil and most of all, loads of high-tech talk tweens and teens love, along with a mix of magic thrown in. The book is divided into five parts and each short chapter keeps moving the story forward at a fast, action-filled pace that is certain to pull in even the most reluctant of readers. In this sci-fi adventure, a robotic girl named Geneva travels back to the year 1542 in an attempt to recruit a bullied and friendless 12-year-old boy named Charles to join her on an urgent mission. If Geneva can convince Charles to return with her via time travel (SMASHER) to a futuristic city called LAanges, together they might be able to thwart a world takeover by an egotistical and cunning villain named Gramercy Foxx. Despite living in a remote mountain village near the town of Eamsford, Charles, or Charlie as Geneva calls him, has a penchant for puzzle-solving and is also gifted. Somehow Geneva also knows that Charlie can perform feats of magic and I’m not talking pulling rabbits out of a hat. This ability will serve the kids well when they try to outwit and out-tech the wily Foxx. Once back in LAanges, Charlie and Geneva must move quickly to solve the mind-control menace that Gramercy Foxx plans to unleash via computer software called The Future. As the team tackle obstacle upon obstacle to breach the multi-layers of security Foxx has installed to keep enemies at bay while keeping his devious plan on track, they soon realize there is something much more sinister behind Foxx’s efforts to takeover the planet. Promising a world of peaceful coexistence and well-being, Foxx’s goal is anything but harmonious. Time, however, is not on Charlie and Geneva’s side as they use every means possible to stop Foxx. It’s not until Charlie, with the help of his new trusted canine companion, confronts some long hidden secrets that he’s able to face some startling facts and go head to head with Foxx. With SMASHER, Bly’s created a couple of characters kids will care about and a wicked nemesis they’ll want to see made powerless. So now you may wonder, does The Future look bright for Foxx anymore? Can humanity be saved? Travel through time courtesy of SMASHER to find out who will ultimately win control of our world and enjoy your journey! 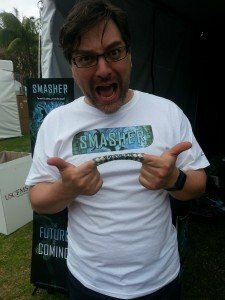 Parents – if you want to find out more about SMASHER, visit SMASHEROnline.com for a peak into The Future!